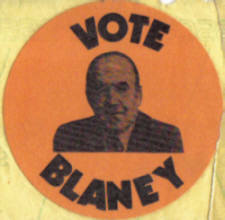 Neil Blaney was originally elected as a Fianna Fail TD in 1948 (a by-election caused by the death of his Father Neal Blaney). After a successful Ministerial career, he was sacked from cabinet over what led to the ‘Arms Trial’. It wasn’t though until 1972 that he was expelled from Fianna Fail for ‘conduct unbecoming’. Neil Blaney then set about the foundation of the Independent Fianna Fail organisation in Donegal. He was returned 8 times to the Dail and twice to the European Parliment. After his Death in 1995 the subsequent by-election was won not by his Brother Harry, but by Cecilia Keaveney, daughter of former Independent Fianna Fail TD Paddy Keaveney…. These are from the 1989 Euro Elections. I have three different leaflets with the same picture but different slogans. The back of each leaflet was different and where you will get an idea of the policies and the experience of the man. His ‘Record’ reads like a historical document of the 50s, 60s,70s and 80s. In an age where most politicians were members of GAA clubs, Blaney continued the tradition of soccer in Donegal as he had a spell as President of the FAI. You will also see the ‘Troops Out’ heading, Blaney was unashamedly Republican. Hi well done great posting!! Good to see the Blaneyites have not all gone to Fianna Fail, even though there are plenty of people telling everyone that all the Supporters joined FF. I am a guest with patricia mc Kenna next Monday in Letterkenny for a public meeting about the lisbon treaty We are pushing for a no vote! 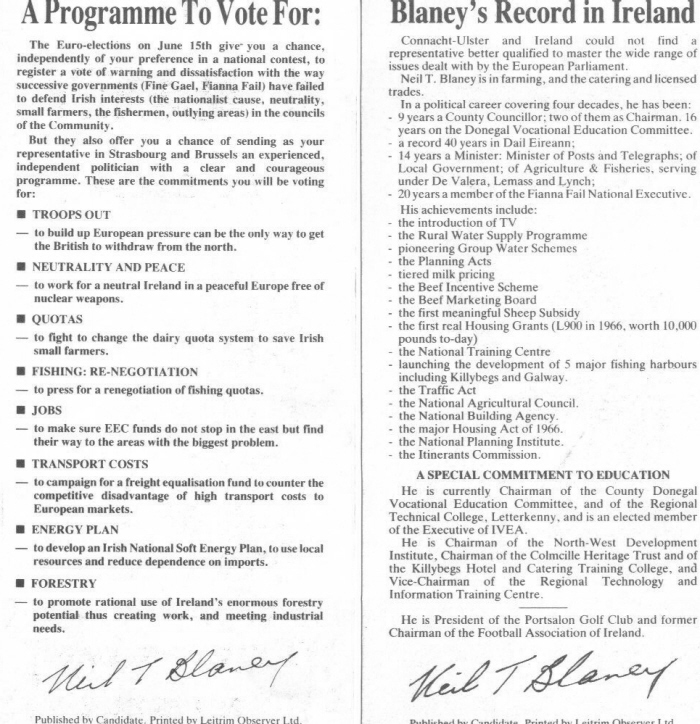 I could ask you , where on the net could I find archives of speeches made by Neil T on the previous European referenda..
anyhow … Some of Neil T. Blaneys views on the EU and the Single European Act are made here by his contributions to the Dail to the debate on the Single European Act. Hope they are of some help to you.